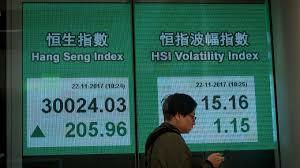 Headline indices of the Hong Kong share market were lower after briefly touching their highest level in a month in midmorning trade on Thursday, 26 July 2018, as profit taking resumed after strong rally early this week on Beijing's stimulus plan and on caution ahead to interim corporate earnings results due out in coming weeks. The investors largely shrugged off an overnight Wall Street rally after the US and European Union agreed measures to avert a transatlantic trade war. Sectors were mixed for the day, with most of them little changed. Around late afternoon, the Hang Seng Index declined 205 points or 0.7% to 28,715.93. The Hang Seng China Enterprises Index dropped 87.46 points or 0.8% to 10,986.70. Shares of software developers were lower after Facebook crashed 20% overnight in US trade. Chinese tech giant Tencent slipped 2% to HK$372.2. Kingsoft Corporation (03888) and Chinasoft International (00354) also dipped 2.6% and 1.8% to HK$20.35 and HK$6.43. Financials were also soft. HSBC Holdings was down 0.3% to HK$74.85, AIA Group eased 0.2% to HK$68.85 and PICC Property & Casualty dropped 1.9% to HK$8.58. Shares of property developers rose, led by Road King Infrastructure, after it announced a positive profit warning, with sales up 17.77% on year, at about 18.7 billion yuan (US$2.8 billion) for the six months ended June 30. The result was boosted by property sales of 17.225 billion yuan and toll revenue of expressway projects of 1.47 billion yuan. Longfor Group Holdings gained 4% to HK$23.65, Logan Property Holdings rose 3.3% to HK$10.76 and Shimao Property Holdings was 2.9% higher at HK$23.30. Sands China (01928) edged up 0.6% to HK$41.75 after it reported 2Q earnings growth of 30%. China Mengniu Dairy (02319) sank 3.7% to HK$24.55 after Macquarie Research published a research report giving bearish comments on the company. Jinchuan Group International Resources (02362) said it expects its consolidated profit attributable to owners for the six months ended June 2018 to amount to US$60 million, a substantial increase as compared to that of US$8 million for the corresponding period in 2017. The increase in profit is mainly due to the increased effort by the management team to improve the operation efficiency of the group, including cost saving, continuous technical innovation and improvement of production flow; increase in the average selling price of copper and cobalt year-on-year respectively; and the increase in production of copper and cobalt. Yanzhou Coal Mining (01171) said its production and sales volume of saleable coal amounted to 24.21 million tonnes and 28.1 million tonnes for the second quarter of 2018, an increase of 45.06% and 32.67 % from the same period last year. For the first half of 2018, the accumulated production and sales volume of saleable coal amounted to 48.5 million tonnes and 55.5 million tonnes, up 39.69% and 33.09% year-on-year.